USS Blakeley received its name in honor of Captain Johnston Blakeley, a Navy hero of the War of 1812. The Navy brought her into service upon her commission in May 1919. The ship was part of the Atlantic Fleet. She patrolled the Eastern Seaboard for the next few years before her initial decommission in June 1922. She served with the Scouting Fleet between 1932 and 1937. The Navy recommissioned her in October 1939. For the next couple of years, the ship participated in the Neutrality Patrol. 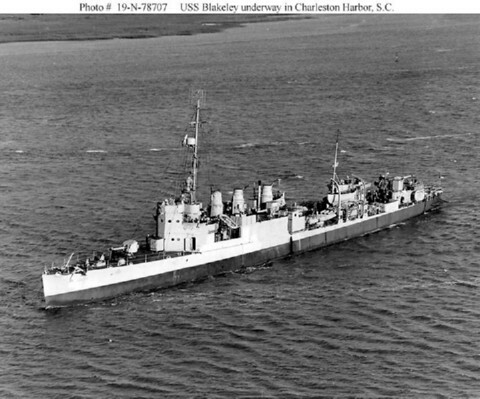 After the US entered the Second World War, USS Blakeley took up patrol in the Caribbean. She provided cover for convoys and searched for submarines. In early May 1942, while on patrol off of Martinique, German U-boat U-156 sent torpedoes into her side. Six men died with twenty-one others injured. Despite losing over fifty feet of her bow, the crew saved the ship. She underwent extensive repairs for the next few months. She returned to duty in September 1942, in the Caribbean. That was her home waters for the next few years except for a couple of voyages in the North Atlantic and Tunisia. In early 1945, she did training duty off the Eastern Seaboard. The Navy decommissioned her in July 1945 and sold her in November of that year.